The car was delivered on July 5, 1948 to Ratcliffes Garage and registered as GRK 384 (gray paint with gray interior), little is known of the early history of this motorcar except to note that it was abandoned, it is thought, in the 1970’s in a field and left there for approximately 20 years before it was acquired by a Mr. John Aldridge, an architect and amateur racer from London in 1997. Appreciating the Allard marque for its performance potential, he set about breathing life back into it. John Simmons of Lowestoft were instructed to restore the body with Nordian Exports of Leadon Roding re-building the engine. A period of racing, sprints and hill-climbs then ensued. It then moved into the hands of the current owner in 2007. Interestingly, the vendor of this extraordinary example has a mindset not unlike Sidney Allard. In as much there is a focused mind at play with one goal and no deviations. Unlike Sidney Allard though, it is not the need for power and performance but that of quality workmanship, attention to detail and a thorough mechanical pursuit of zero tolerance derived from an engineer’s critical eye. BAS 120 now began a restoration process unlike any other. The car was de-constructed into its constituent parts and those parts restored or replaced if even the slighted imperfection was found. This included re-building the door handle mechanisms, complete drive train and every mechanical and electrical component in-between. The stainless steel exhaust was replaced with a better stainless steel exhaust and the rear axle ratio was changed from 4.11-1 to 3.25-1providing improved fuel economy and top speed without compromising the performance of the high torque engine. It now runs with a ¾ race cam and still retains the original three speed gearbox. The original cast iron heads have been swapped with improved aluminium Offenhauser units and the manifold mated to quad-barrel Holly carburettors instead of the previous two barrels. The aluminium radiator has 50% more capacity and the crankshaft, clutch, flywheel and pistons have all been dynamically balanced to give a smoother power delivery and overall performance. The attention to mechanical perfection (as well as the recent comprehensive service and oil change) would make Sydney Allard proud. 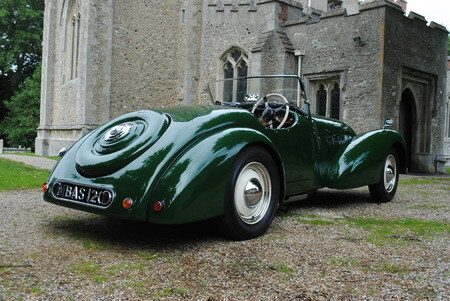 The exterior is equally immaculate with lustrous green coachwork and matching green leather interior. Full weather gear is included to make this prize-winning, fast road specification Allard one of finest on the planet.